The Florida Scrub-Jay is an outlier. This species was isolated along the Lake Wales Ridge in the late Pliocene or early Pleistocene era following the last ice age. As global temperatures increased and glaciers melted, sea level rose causing the ridge to become one of the few parts of Florida left above water. This isolated the birds from more western populations and the differences between them became more pronounced. 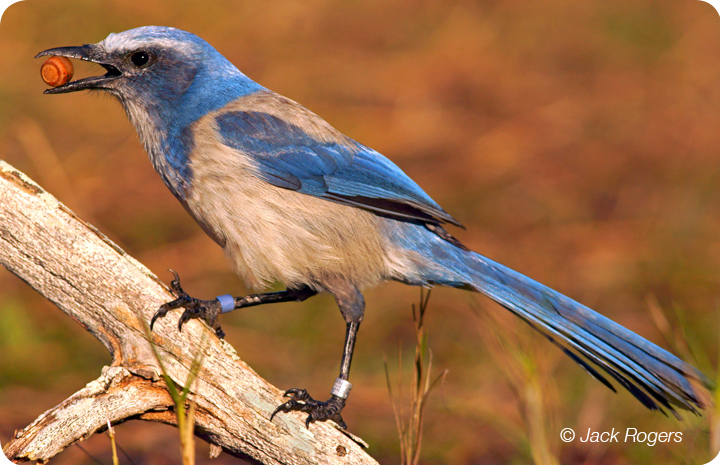 Florida Scrub Jays are gregarious and live in family groups of multiple generations. The species is threatened due to habitat loss; Scrub-Jays are very insistent about living in scrubby habitats dominated by scrub oaks, pines, and dry conditions. Scrub oak acorns are one of their most important foods.